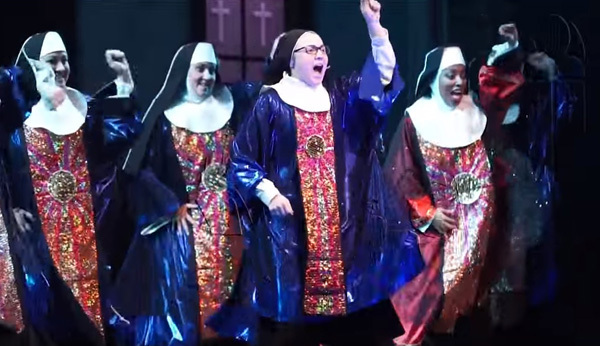 The musical Sister Act – with the participation of Suor Cristina – is preparing to perform in Rome at Brancaccio Theater in December 2016. Two trailers of this coming musical are already available in Italian. In the photos on this page you can have a preview of what is coming soon. Above, you see nuns in a frenzied dance wearing a red, purple and gold scapular adorned with a circle surrounded by rays, an allusion to the Blessed Sacrament. In itself this photo represents a desecration of both the Eucharist and the religious habit. Below, first five rows, Suor Cristina appears in her night clothes in what seems to be a “prayer” to change the life of her religious community. The more relevant point in the photos (two first rows) is that her night pajamas allows the viewer to envision, without too much difficulty, the form of her breasts. Such a display is hardly an action recommended for a nun. Then, what seems to be a fairy-like Italian-African dancer appears in her dreams (fourth row) and invites her to enter a new type of life. One is led to imagine that this life is represented by the dancing nuns (sixth to eighth rows), who also wear the red-purple-gold scapulars mentioned above (ninth and tenth rows). In a final phase, the nuns appear in white-gold habits (eleventh and twelfth rows). The ensemble, as noted in the previous post, desecrates religious life and blasphemes Catholic symbols. A video of the trailer from which these photos were taken is available here, another with more blasphemies here.